London: Five footballers are reportedly suspected of filming Jihadi John's beheading videos after they recently travelled from Britain to Syria to join the Islamic State (IS). Security chiefs are probing if the east London gang of young football players -one of whom claims to have trained with Arsenal, were involved in making the horrific execution videos that left the world in shock. They believe that these footballers might lead the authorities straight to killer 'John' who is wanted for the murders of at least five hostages, the Daily Star reported. On Sunday the dad of a possible sixth victim, Japanese hostage Haruna Yukawa, was overwhelmed with grief after another video reportedly appearing to show an image of his son's beheaded corpse appeared online. 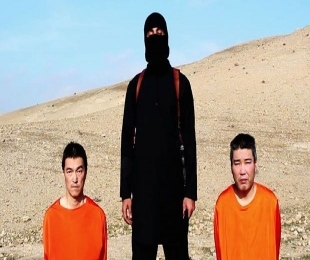 Last week Jihadi John gave the Japanese government 72 hours to pay a 130 million-pound ransom or vowed that he would kill military company operator Yukawa and fellow countryman Kenji Goto. Over the weekend journalist Goto appeared on film holding a picture of his executed friend and warned that he too would be killed unless Iraqi terrorist Sajida al Rishawi was released. And as the world reeled from the latest terror video, the British Security chiefs were desperately probing the football gang feared to have become involved in the brutality. The five jihadists, who are all said to be talented footballers with one having reportedly played in Sporting Lisbon's youth team, from Leyton and Walthamstow are Portuguese immigrants who converted to Islam and were radicalized in London before deciding to wage holy war abroad.